The Kokeshi studio of Akihiro Sakurai, is located in Naruko, Miyagi Prefecture, Japan. Naruko, a very famous spa community, has one of the oldest and strongest traditions of Kokeshi that dates back more than a hundred years. Surrounded by the majestic nature of Naruko and nurtured by a lively flow of travelers, they are always striving for further sophistication while honoring generations of family Kokeshi tradition—meeting contemporary demands while promoting Kokeshi culture. They produce traditional Kokeshis in types such as “Iwazo,” “Mannojo,” and “Eikichi,” (all named after their ancestors) as well as wooden Hina-ningyo type Kokeshis. Kokeshi has a tradition nurtured by harsh winters, blessing of hot springs, and uncompromising craftspeople-kokeshi, a type of simple, traditional wooden doll, is thought to have originated as a children's toy during the mid-19th century in the hot-springs communities deep within the mountains of today's Miyagi Prefecture. In the mid-20th century, people "discovered" kokeshi, and the emergence of collectors transformed it from an everyday toy to a coveted treasure for all generations. With their stark simplicity and gentle expressions, kokeshis have long been used as beloved gifts suitable to a variety of occasions, such as birthdays, house warmings, weddings, and births, and as unique design objects to illuminate contemporary homes. This companies Kokeshi tradition goes back to Matagoro Ohnuma, who is believed to be the founder of Naruko Kokeshi, towards the end of the Edo period. 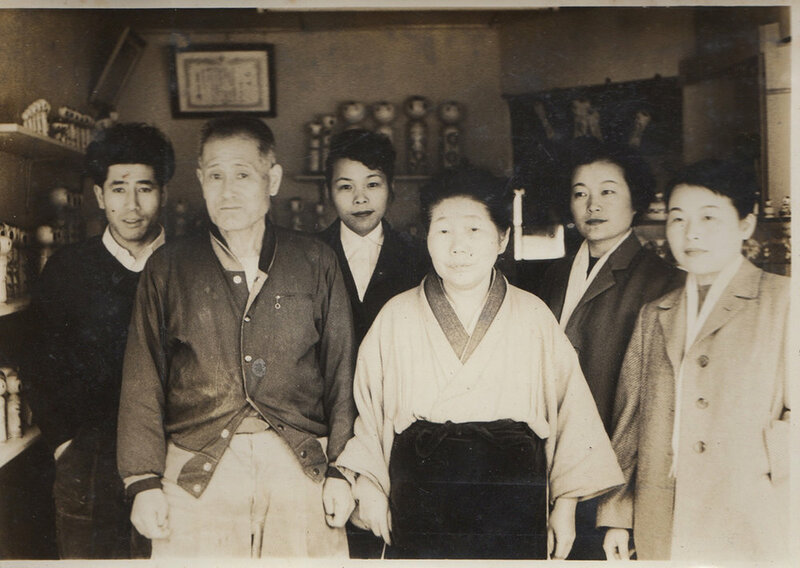 Since then, surrounded by the abundant nature and hot springs of Naruko, they have produced Kokeshi for generations. Although the environment that surrounds Kokeshi has changed drastically over the course of 150 years—including social transformations, booming demand, and changing taste—their fundamental attitude towards Kokeshi has remained unchanged: pursuit of tradition and exploration of new possibilities. Today, with an aging and declining population and challenges faced within the local economy, the situation of Kokeshi craft in Naruko is not an easy one. However, with Akihiro’s young son, Naomichi returned back from Tokyo his studies in Tokyo, and are striving to revitalize this unique craft in a sustainable way, accommodating contemporary demands while maintaining tradition. Most of the kokeshis are made of Mizuki wood, dogwood/cornus in english. Its name translated in english means "water wood", it is known in Japan to resist well to fire and having a kokeshi at home protects the entire house from it. It is also strong yet light to support its sculpture and painting. Sakura cherry wood is also a common type of wood used for kokeshis, you can easily see the difference as Sakura is darker compared to Mizuki.